Set includes a beige 2.8 qt. 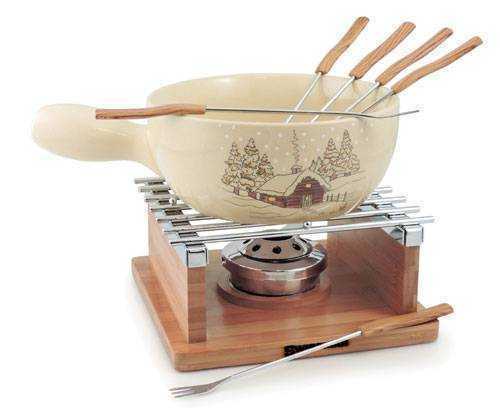 ceramic pan with an Alpine cabin winter scene, a wood and stainless frame, paste burner, and 6 wood-handled cheese forks. Note: Paste fuel not included - order paste fuel separately. Service Area: New Glarus, Madison, Janesville, Freeport, Rockford, Loves Park, Machesney Park, Stoughton, Monroe, Platteville, De Forest and surrounding communities.